Meredith Mitchell (Shades of Murder, 2001, etc.) just wants to help an old friend, but winds up embroiled in two murders spanning a quarter of a century. Superintendent Alan Markby warns his fiancée that Toby Smythe will bring nothing but trouble. But when her fellow foreign-service officer, newly home from Beijing, learns that Alison Jenner, wife of Toby’s wealthy industrialist cousin Jeremy, has been receiving anonymous letters that accuse her of murdering her Cornish aunt Freda Kemp, he knows that Jeremy won’t trust the local police to investigate. So Meredith persuades a reluctant Alan to find out who would dredge up the scandal 25 years after Alison’s acquittal, and why. Meredith suspects that although she spends most of her time in a posh London flat, Fiona, Jeremy’s daughter from a previous marriage, may be using the poison-pen letters to torment her stepmother—until Stebbings, the cantankerous caretaker at Overdale House, finds Fiona floating facedown in the lake. Now Alan must trust Jess Campbell, his most junior officer, to handle the locals while he tackles retired Chief Inspector Barnes-Wakefield and the players in the original Kemp inquiry. As the police proceed by the book, Meredith develops her own agenda, whisking Toby away to Cornwall on what could prove the most dangerous errand of all. 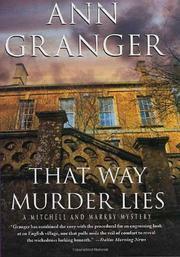 Granger wisely keeps the Markby-Mitchell romance in the background as she highlights the submerged creepiness of the classic village murder.